The wide range of sewing machines available today makes it very difficult to pick one. Don’t you agree? Well, this is not a problem anymore. Whether you are just a novice or an experienced user, there is one machine that comes with excellent performance and amazing features. This sewing machine makes all kind of sewing a breeze. In this article, we are going to do an in-depth review of a highly versatile and durable sewing machine. 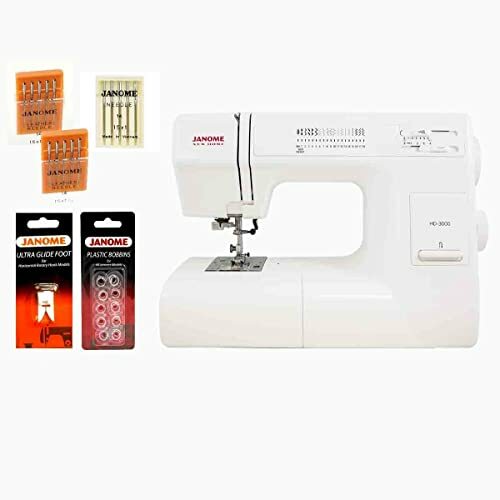 The Janome HD3000 Sewing Machine is the best option if you are looking for a mechanical sewing machine. The HD3000 is a versatile machine that can handle heavy duty work requirements with ease. Although it is not computerized, this sewing machine has many features. 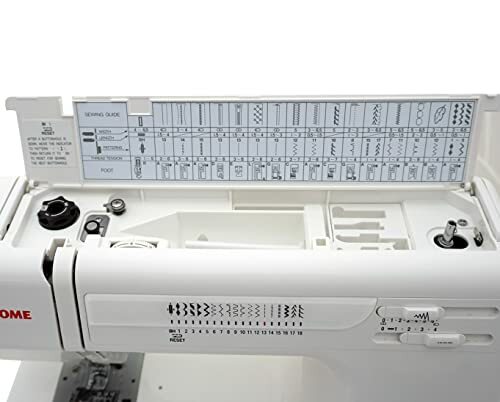 You are about to learn all about these features which give the Janome an edge over all other sewing machines available. The look of Janome HD300 is aesthetically pleasing. Its simple design and square body make it look crisp and sturdy. It has a convenient automatic bobbin system with an extended body and 18 stitches which allow you to create different designs easily. And that’s not all. It has a solid frame that makes it durable and offers stability when in use. This machine weighs 20 lbs. and stays stable even when you do some very fast sewing. It has dials instead of computerized controls which can be very confusing for people who are not abreast with the latest technology. Mechanical sewing machines provide a pure sewing experience and offer a much better value for money. With the Janome HD3000, you can be sure of high performance at very affordable rates. It has all the features required by users to complete various projects. It has a very simple and easy interface making sewing a pleasure. The 18 stitches are more than enough for any sewing that you might want to try. The winding and threading of the bobbin are also very easy. The foot pressure adjustment dial is provided inside the lid. There is also a guide inside the cover which allows you to choose the appropriate presser foot for various applications. Also included is the note regarding the resetting of the sensor after performing each buttonhole. On the right-hand side is the stitch selection guide. When you select a stitch, a light illuminates under the corresponding stitch on the guide printed on the front of the machine. This helps to make sure that you have chosen the desired stitch in just a glance. The stitch width and length adjustment slides are at the top of the machine. Just slide them to your required settings, and you are good to go. 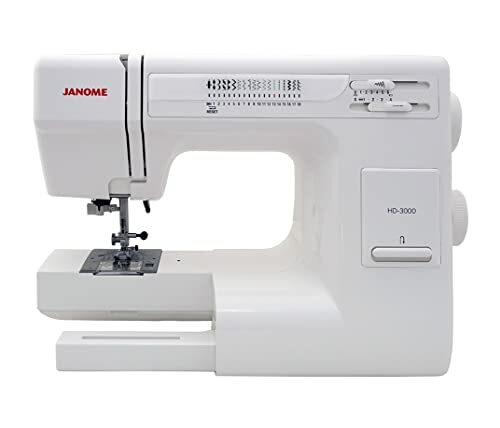 The Janome HD3000 produces 860 consistent and high quality stitches per minute. The Janome HD3000 also has a needle threader and an onboard thread cutter. These useful built-in features are not usually present in mechanical sewing machines. We will discuss these features in detail later. Sewing is not just a practical and useful skill; it is also an invigorating creative expression. The Janome HD3000 is so easy and versatile that it is perfect for all people with different skill levels. The performance of the Janome HD3000 can be easily compared to a commercial machine. This machine is ideal for not only soft materials but heavy materials also. There is nothing more frustrating than your machine jumping around because it is unable to handle the material. But the heavy duty metal frame and sturdy construction of HD3000 enables it to tackle all types of materials. And that’s not all. The superior build quality gives this machine durability allowing it to last you a lifetime. The Janome HD3000 is fitted with a superior feed system featuring a seven piece feed dog. This helps to keep the feeding smooth irrespective of the material. The 1.0 amp motor helps to sew materials such as denim and canvas easily. 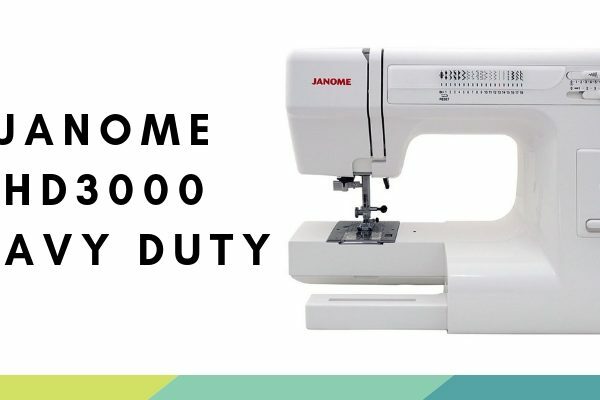 The Janome HD3000 is perfect for both beginners and experienced seamstress alike. Its simple set up, quality performance, and ease of use make it an unbeatable choice irrespective of experience level. You can start operating it within minutes of taking it out of the box. The detailed instruction manual makes sure that you do not encounter any problem while operating this machine. Even if this is your machine, you will find operating it very easy. It also features auto bobbin winding and auto needle threading. The bobbin is top loaded thus making it very reliable and easy to load. As this is mechanical machine navigation is very easy. With just a few buttons you can get your desired stitching done. On the front of the machine are sliders that help adjust stitch width and length and reverse sewing button. On the top of the machine is an accessory compartment where you can store your top thread, tension dial, and other accessories. You can also change the stitch style by simply rotating the dial on the side of the machine. This great feature of HD3000 helps to take the strain of threading the needle away. The jam proof bobbin system makes sure that your project stays in place. The bobbin is covered with a transparent bobbin plate. This helps you monitor the supply of thread from the bobbin making it easier to anticipate how long the thread will last. The adjustable presser foot makes it very easy to work with multiple layers and heavy fabrics. All presser feet can be locked into place easily. You can switch from one stitch to another without using any tool. The free arm capability helps you to sew shirt sleeves and pants legs with ease. The Janome HD3000 comes with a hard case that protects the machine from dust. The cover sits on top of the machine. Thus, it allows you to move the machine easily around the house. Heavy duty aluminum frame – The sturdy and strong frame allows for a stable and durable machine. Detailed reference guide – The instruction manual provides detailed information about the product. This acts as a reference whenever you get stuck. Efficient stitching – This machine is a favorite among experienced dressmakers due to its polished stitching. User-friendly – It is very easy to operate, and the result is flawless. All settings are handy and provide the user complete control. Reverse lever – The placement of the lever at the front make it readily accessible. This great feature reinforces different stitches quickly. Electronic foot controls – These are perfect for working with resistant and thicker fabrics. Automatic needle threader – This feature saves your eyes from stress and saves time. Saves time – The Janome HD3000 can deliver 860 stitches per minute. Its variable speed motor is controlled by foot pedal. So, this machine has no trouble switching from lighter to heavier materials. Convenient storage compartment – the storage compartment near the bobbin holder can hold various accessories. The convenient placement of this compartment makes sure that you have everything you need at hand while sewing. Jam-proof bobbin system – The jam-proof bobbin system makes sewing simple. Bright work light – The built-in work light is correctly places and bright making it easier to work especially at night. Seven-piece feed dog system – This feature helps to feed many different types of fabrics smoothly. Easy maintenance – This machine requires very little maintenance. However, you should clean the feed dogs, bobbin and hook race after each use. You should also have the machine serviced at least once a year if it in regular use. Quality – Some parts of the machine are made of plastic. 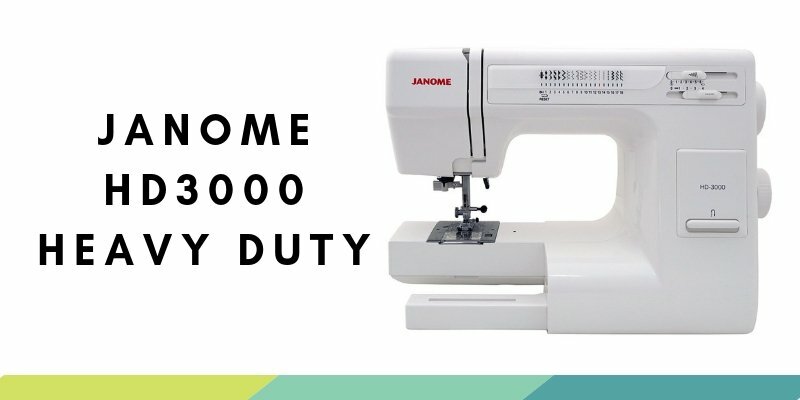 The Janome HD3000 is a mechanical sewing machine that can power through any project. This is because of its fantastic performance and sturdy build. Thus, this machine is a great example that you get what you pay for. Although it may be a little pricier than some of its competitors, the Janome HD3000 outclasses them all and will be with you all your life!